Civilization 4 is the forth instalment of the long running strategy based gaming series and it is just as good as all of the previous versions of the game. The game features some of the most innovative stories I have come across and takes every ounce of your wit to complete and believe me I found it very challenging. I would recommend this game to all strategy game fans as I believe it will keep you thoroughly occupied for hours on end. 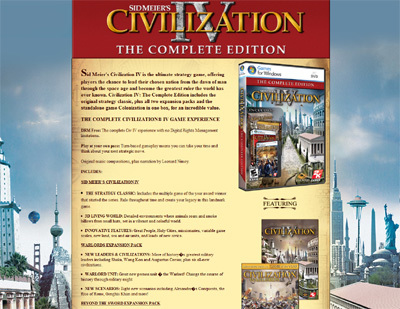 We have also compiled a Review System for this, of which Civilization 4 is Rated as Four Stars, the second highest possible score available from the Game Review Team.